Culzean is a uHP/HT (ultra high pressure / high temperature) gas field located in Block 22/25 of the UK Central North Sea, discovered in 2008. Staged exploratory projects have revealed the field to have real significance, with potential to supply 5% of the UK’s gas requirements by the time production is in full swing in 2020/21. SMOP (Sembcorp Marine Offshore Platforms) is the EPC contract holder for Culzean, which is being developed by Maersk, and the company has appointed Hobbs Valve as the supplier of a multi-million pound order of TOV (triple offset butterfly valves) – a zero-leakage solution that is versatile enough in service to outperform any other butterfly valve in its class, uni/bi-directionally, where full bore is not a pre-requisite but ultimate performance is a must. This represents one of the largest projects to which Hobbs has ever been appointed. 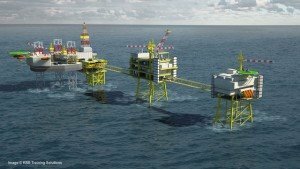 The valves will be used topside in a standalone facility that will consist of a complex of bridge-linked platforms comprising a 12 slot wellhead platform (WHP), a central processing facility and utilities/living quarters for 100 people. The total investment for the project is expected to be in excess of £3bn (US$4.7bn). This significant project was landed for Hobbs by its Regional Sales Manager (UK & Global External Sales) Shane Price, who commented: “Along with a number of offshoot sub-projects for this field, the Culzean job represents an enormous step forward in production for Hobbs Valve. It won’t change how we work, however, ensuring the ultimate in quality, innovation and reliability in each and every valve we supply. Hobbs’ valves have multiple uses in the oil and gas production industry, such as: isolation of reservoirs and storage; steam piping and condensate; cooling water systems; desalinization; and transport of hydrocarbons. The development of the Culzean discovery has been made possible by the UK government’s consultation on an extended uHP/HT allowance, reducing taxes on profits from 62% to 30% at current rates. Forecast plateau production at Culzean is expected to be 400-500 million standard cubic feet per day.